This blog, is dedicated to advancing not only your emotional intelligence but also your soft skills required for living in the corporate world. It is based on careful and dedicated research and trainings into the theory and practice on Emotional intelligence. The conscious minds contains unique set of skills required to increase your ability to use your emotions effectively. 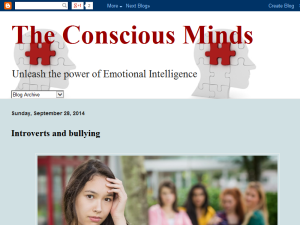 This what your The Conscious Minds Blog Ad will look like to visitors! Of course you will want to use keywords and ad targeting to get the most out of your ad campaign! So purchase an ad space today before there all gone! If you are the owner of The Conscious Minds, or someone who enjoys this blog why not upgrade it to a Featured Listing or Permanent Listing?